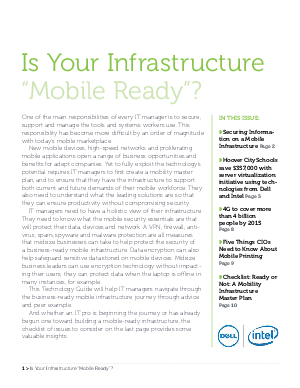 > Dell > Is Your Infrastructure "Mobile Ready"? Small and medium businesses are increasingly challenged to provide comprehensive security for their mobile infrastructures without sacrificing the productivity it was designed for in the first place. For many, the problem is not so much about understanding the primary security issues, such as prevention, detection and response, but rather how to provide that type of end-to-end protection in a mobile environment. Although no two situations are ever the same, the objective is always the same: protect the data that is so important to your business.